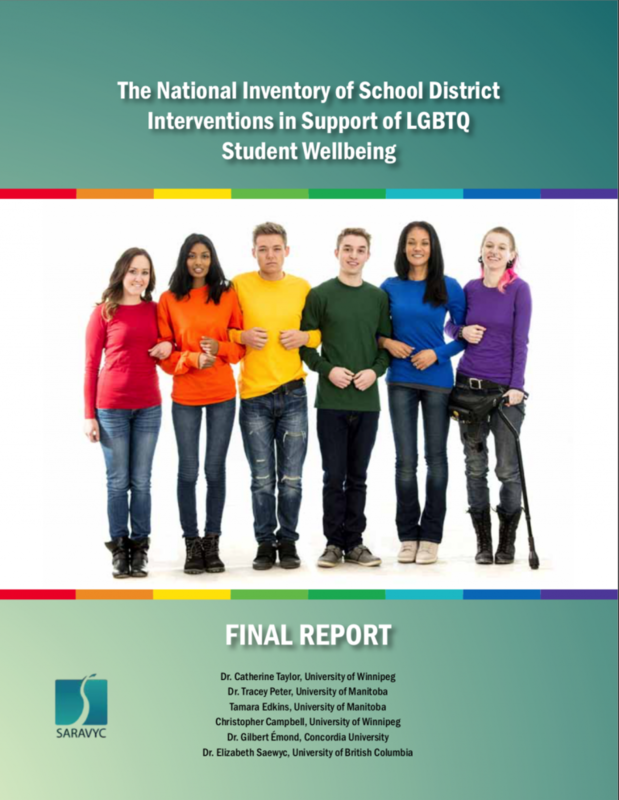 The National Inventory of School District Interventions in Support of LGBTQ Student Wellbeing was one of five research areas in a large project funded by a $2 million grant from the Canadian Institutes for Health Research and headed by Dr. Elizabeth Saewyc at University of British Columbia, “Reducing stigma, promoting resilience: Population health interventions for LGBTQ youth”. All CEOs of school districts in both French and English publicly-funded school systems of Canada were invited to complete a survey which asked them about a range of possible interventions in support of LGBTQ students: LGBTQ-inclusive policy, generic and LGBTQ-specific harassment procedures, course content, Gay-Straight Alliances, generic and LGBTQ-themed events, professional development, and teaching resources. Response was strong at 36% (200 superintendents/directors from 141 school districts), and was representative of Canada’s 394 school districts in terms of rural/urban, regional, French/English, and secular/Catholic, enabling us to develop a detailed inventory of system interventions and to identify patterns. We were especially interested in the general question of which interventions CEOs associated with which outcomes, in order to develop a sense of alignments and disparities between the two as we work in the larger project to identify the outcomes actually achieved, or even achievable, by particular interventions. (For example, GSAs have been widely adopted as a simple, low-cost method of pursuing LGBTQ student wellbeing; we are interested to know what specific outcomes CEOs associated with GSAs, and whether GSAs could actually be expected to have the expected results.) To this end, we asked about a range of outcomes such as reduced high-risk behavior, increased support among staff and students, and lower harassment.